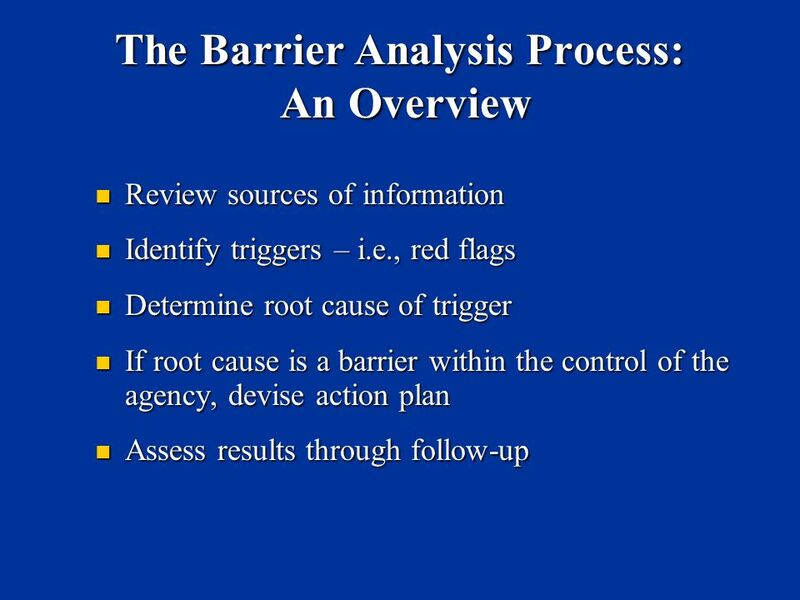 3 What is Barrier Analysis? An investigation of the any triggers indicating that workplace policies, procedures, or practices are having a negative impact on one or more protected EEO groups, with an eye toward identifying the root causes of those anomalies so that they can be addressed and eliminated, if possible. 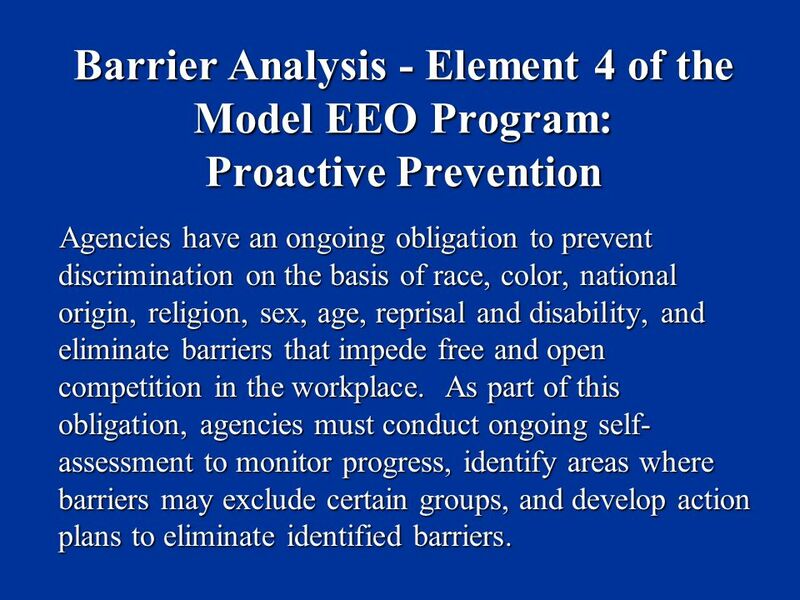 A problem that inhibits an agency's efforts to develop a model EEO program. Agencies should use the Self-Assessment Checklist, (MD , Part G (123 measures)) to identify strengths and weaknesses in their EEO program. 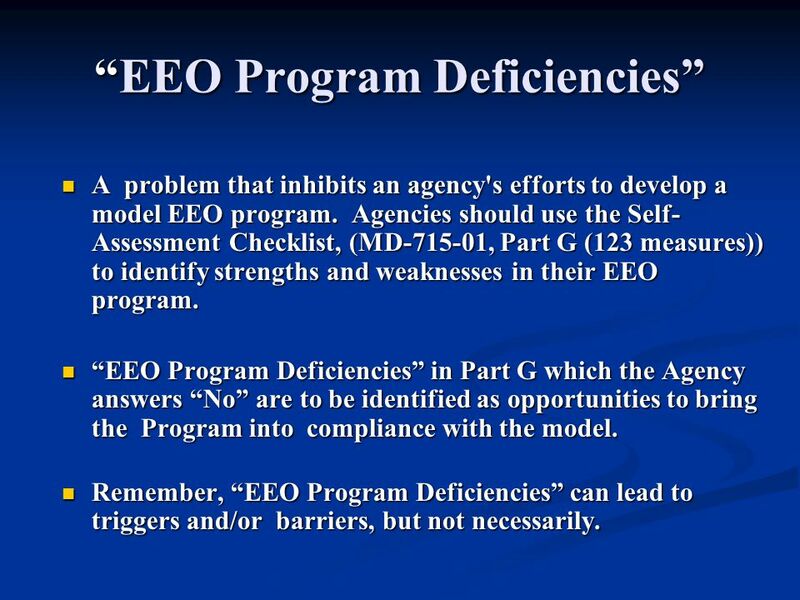 “EEO Program Deficiencies” in Part G which the Agency answers “No” are to be identified as opportunities to bring the Program into compliance with the model. 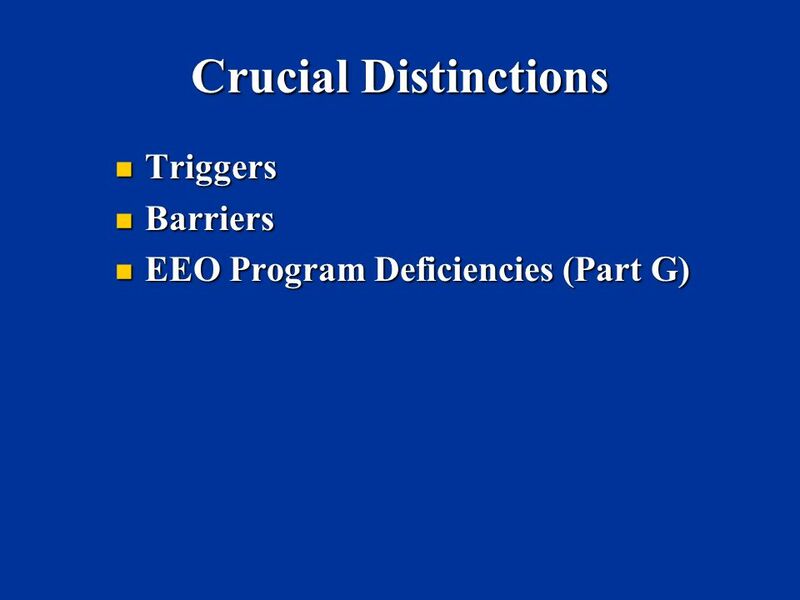 Remember, “EEO Program Deficiencies” can lead to triggers and/or barriers, but not necessarily. All new supervisors are not provided a copy of Equal Employment Opportunity policies upon their appointment. 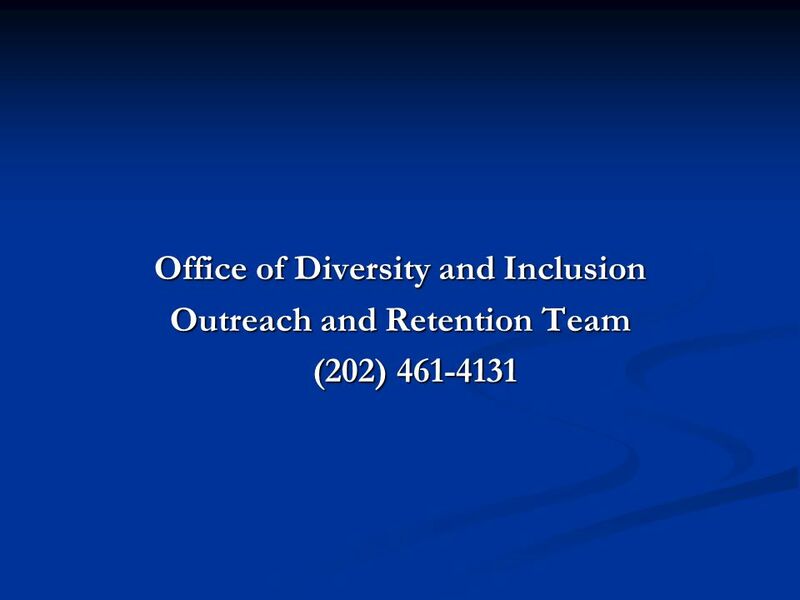 Lack of consistent coordination among Human Resources (HR) and EEO Office on matters affecting the integration of equal employment opportunity in the Agency's strategic mission. 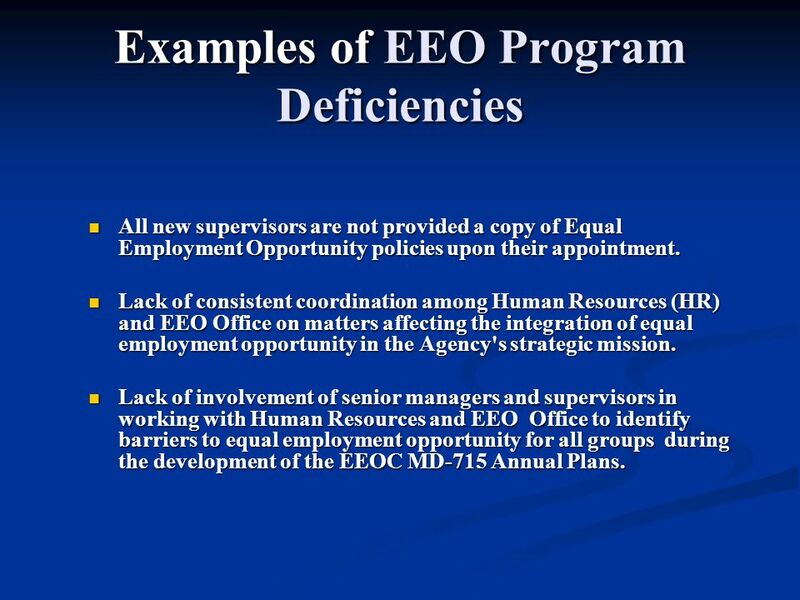 Lack of involvement of senior managers and supervisors in working with Human Resources and EEO Office to identify barriers to equal employment opportunity for all groups during the development of the EEOC MD-715 Annual Plans. 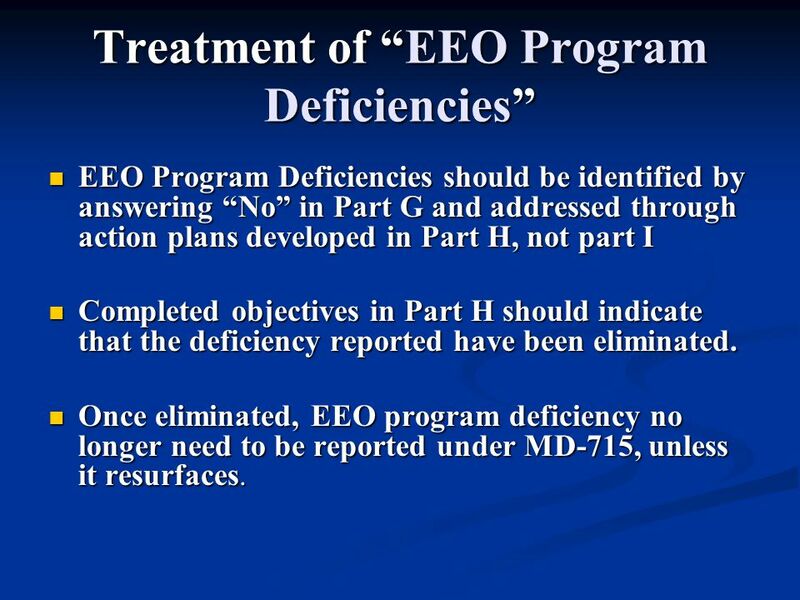 EEO Program Deficiencies should be identified by answering “No” in Part G and addressed through action plans developed in Part H, not part I Completed objectives in Part H should indicate that the deficiency reported have been eliminated. 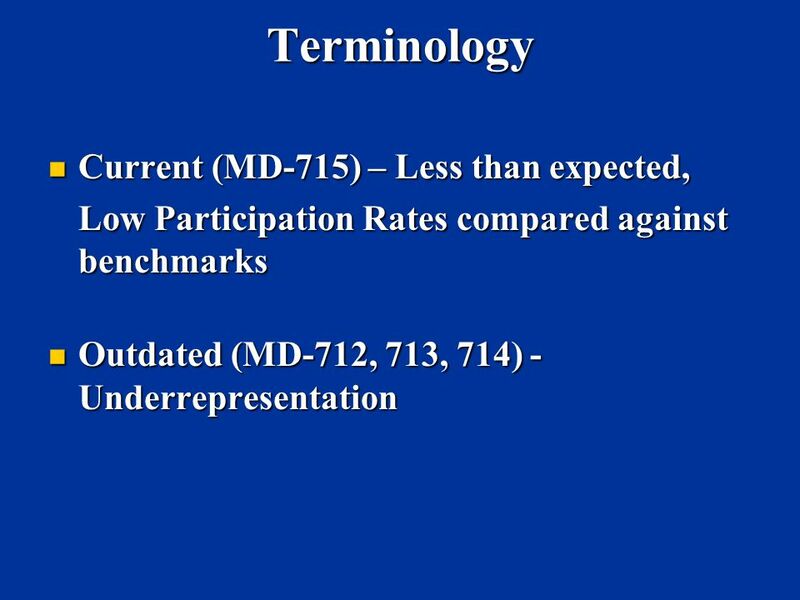 Once eliminated, EEO program deficiency no longer need to be reported under MD-715, unless it resurfaces. 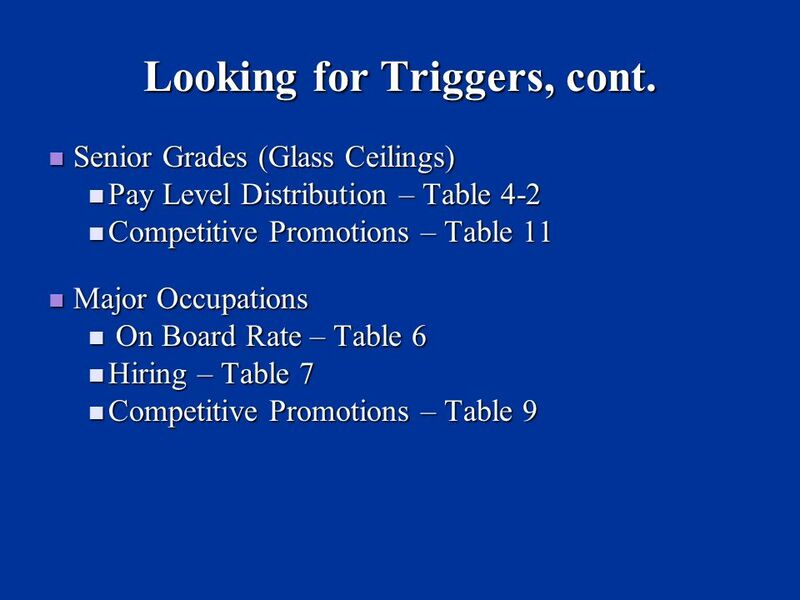 Triggers are conditions, disparities, or anomalies warranting further inquiry. 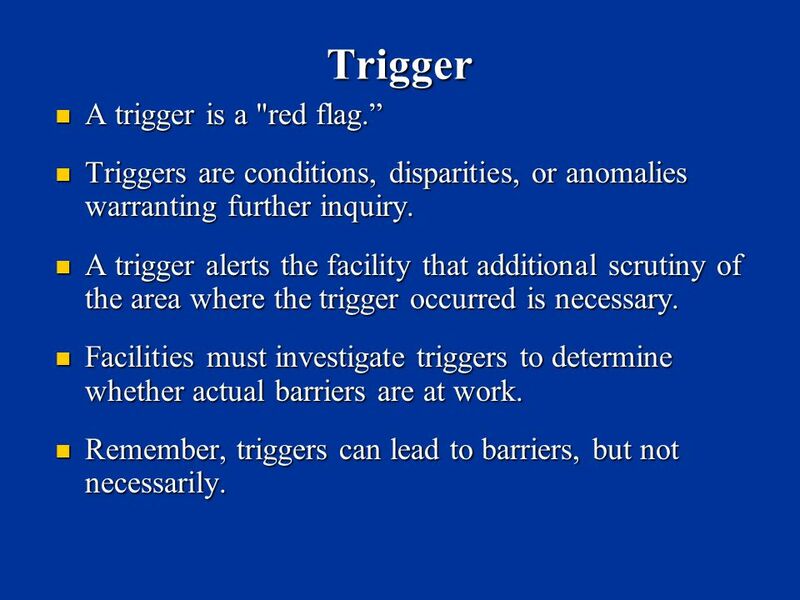 A trigger alerts the facility that additional scrutiny of the area where the trigger occurred is necessary. 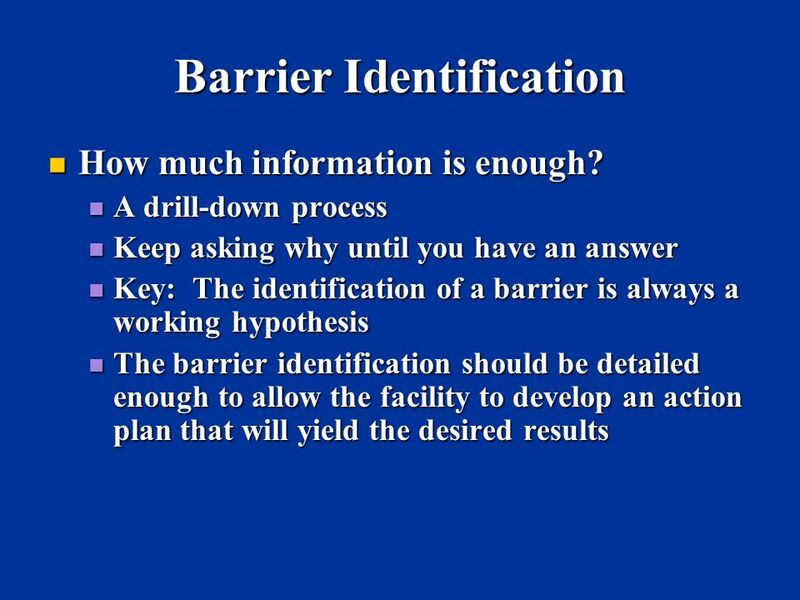 Facilities must investigate triggers to determine whether actual barriers are at work. Remember, triggers can lead to barriers, but not necessarily. 11 Examples of Triggers The net change for individuals with targeted disabilities declined by 3.3% as compared to a 3.0% increase for the overall workforce. 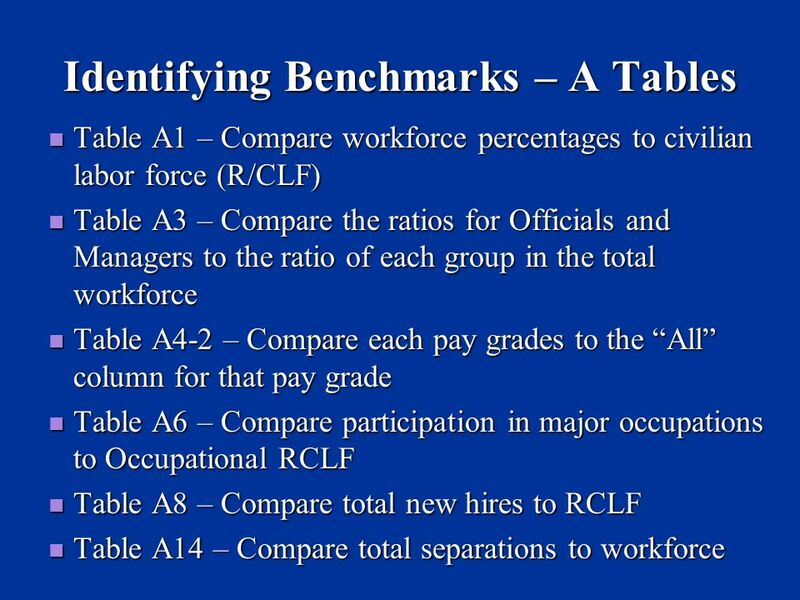 The participation rate of Hispanic women is lower than the RCLF. High separation rate for Hispanics, compared to their on board ratio. Low ratio of Asian men in senior level positions, compared to their on board ratio. Employees are transferring to other agencies for promotions. 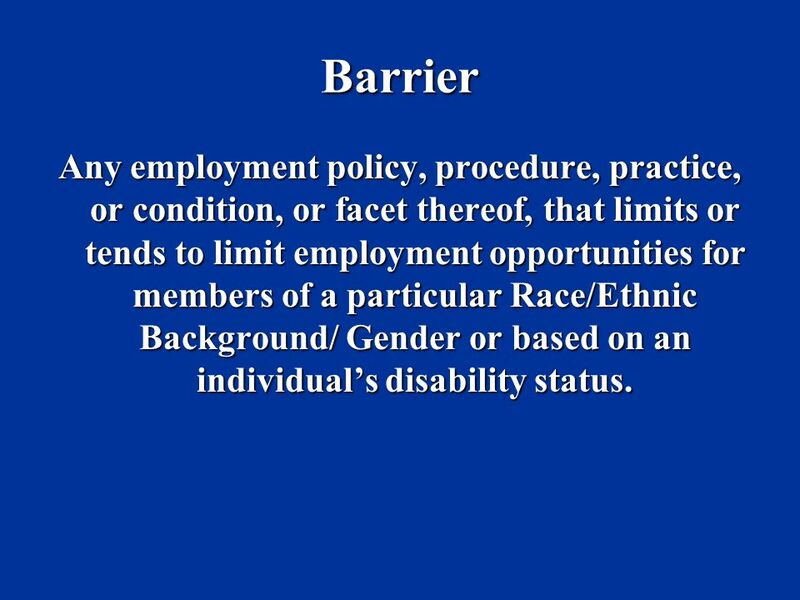 12 Barrier Any employment policy, procedure, practice, or condition, or facet thereof, that limits or tends to limit employment opportunities for members of a particular Race/Ethnic Background/ Gender or based on an individual’s disability status. Example: Agency will hire only at higher grades, as opposed to hiring at entry level. Attitudinal Example: Belief on part of senior executives that women will not be as committed to the agency’s mission after having a child. 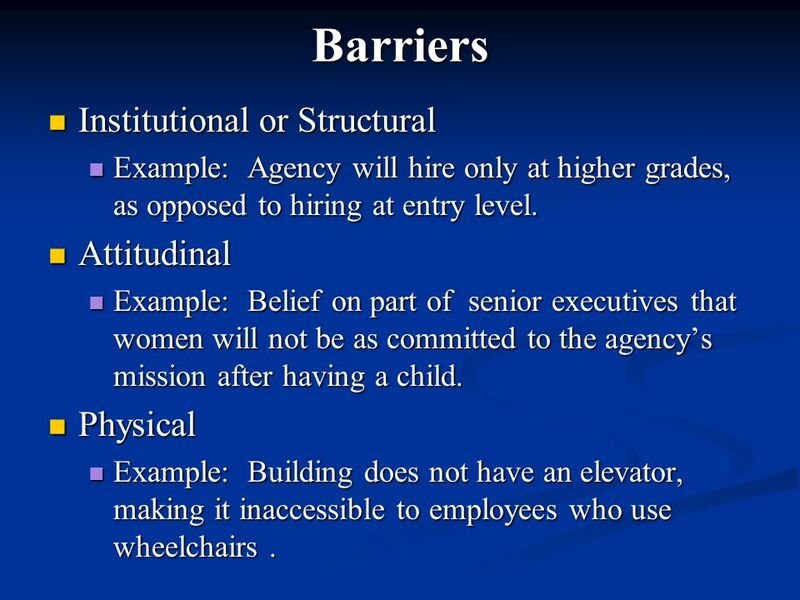 Physical Example: Building does not have an elevator, making it inaccessible to employees who use wheelchairs . 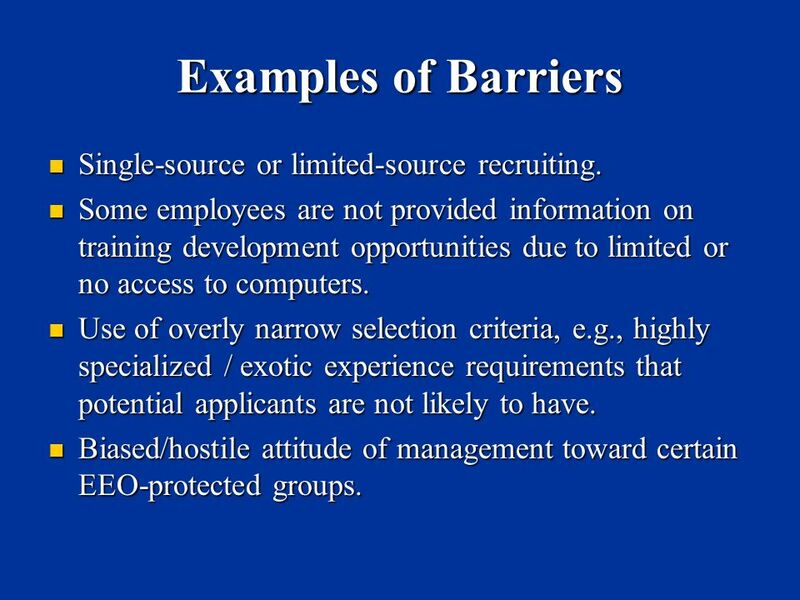 14 Examples of Barriers Single-source or limited-source recruiting. Some employees are not provided information on training development opportunities due to limited or no access to computers. Use of overly narrow selection criteria, e.g., highly specialized / exotic experience requirements that potential applicants are not likely to have. Biased/hostile attitude of management toward certain EEO-protected groups. 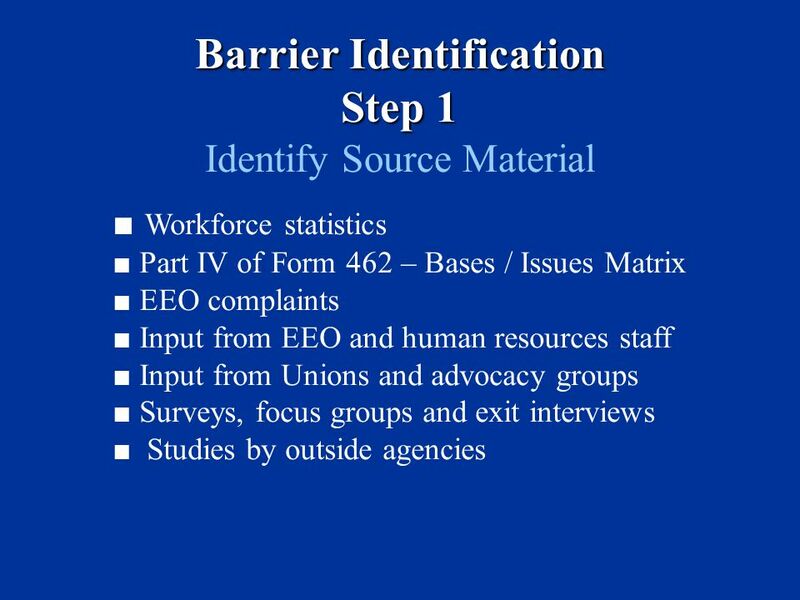 Identify Source Material ■ Workforce statistics ■ Part IV of Form 462 – Bases / Issues Matrix ■ EEO complaints ■ Input from EEO and human resources staff ■ Input from Unions and advocacy groups ■ Surveys, focus groups and exit interviews ■ Studies by outside agencies Barrier analysis should be: (1) focused; (2) methodical; and (3) involve the participation of all relevant agency officials. Identify Triggers/Red Flags ■ Lower than expected participation rates for one or more groups? ■ High separation rates for one or more groups? ■ A surge in EEO complaints out of one shop/region or on one particular basis? ■ Unfavorable responses on employee surveys? 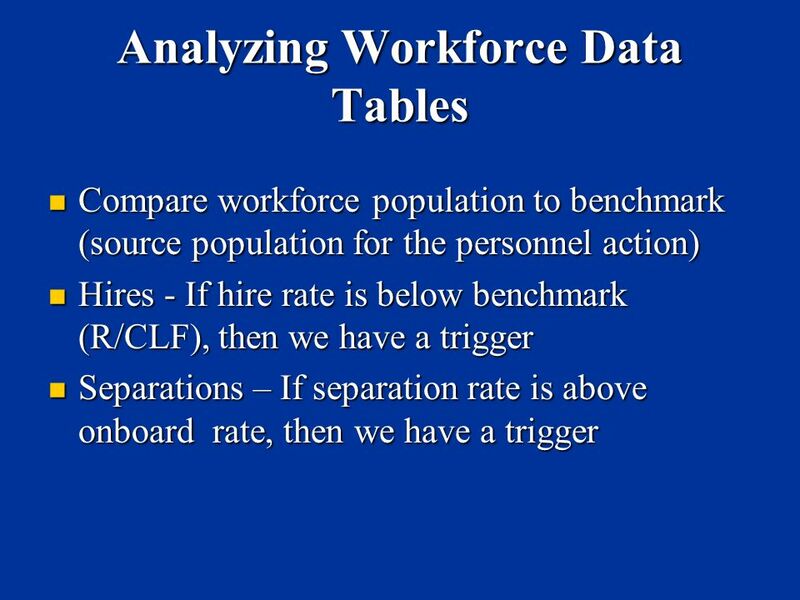 ■ High termination rates for a particular group? ■ Others? After reviewing source material, sort issues into triggers and program deficiencies. Program deficiencies should be addressed in Part H Barrier analysis should be: (1) focused; (2) methodical; and (3) involve the participation of all relevant agency officials. 22 Looking for Triggers, cont. 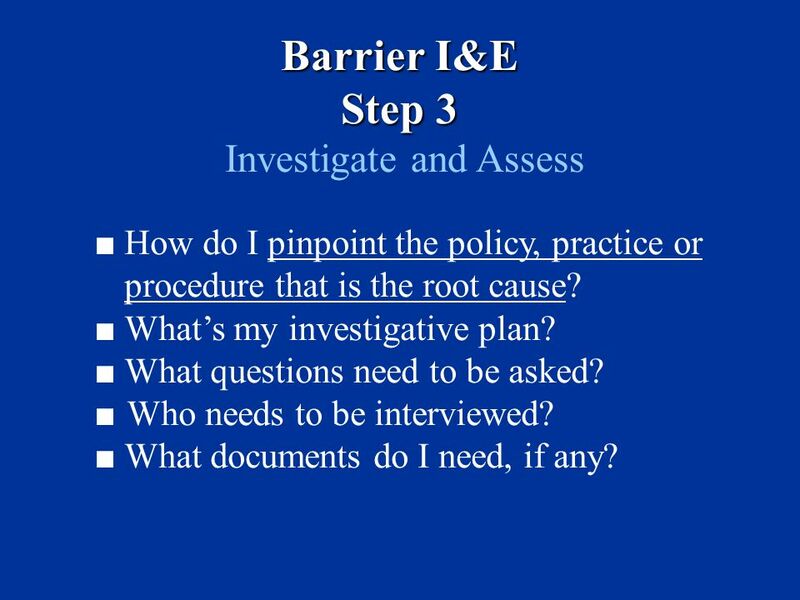 Barrier I&E Step 3 Investigate and Assess ■ How do I pinpoint the policy, practice or procedure that is the root cause? ■ What’s my investigative plan? ■ What questions need to be asked? ■ Who needs to be interviewed? ■ What documents do I need, if any? Barrier analysis should be: (1) focused; (2) methodical; and (3) involve the participation of all relevant agency officials. 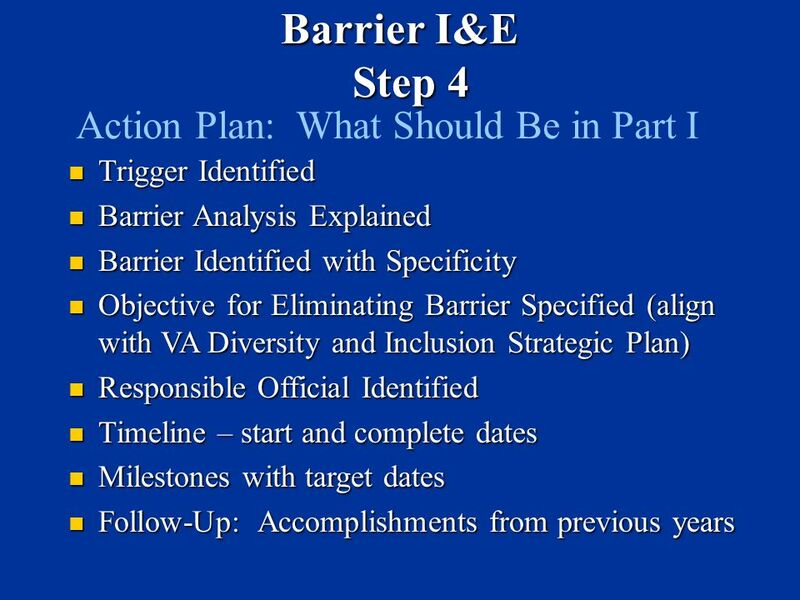 Barrier I&E Step 4 Action Plan: What Should Be in Part I Trigger Identified Barrier Analysis Explained Barrier Identified with Specificity Objective for Eliminating Barrier Specified (align with VA Diversity and Inclusion Strategic Plan) Responsible Official Identified Timeline – start and complete dates Milestones with target dates Follow-Up: Accomplishments from previous years Barrier analysis should be: (1) focused; (2) methodical; and (3) involve the participation of all relevant agency officials. 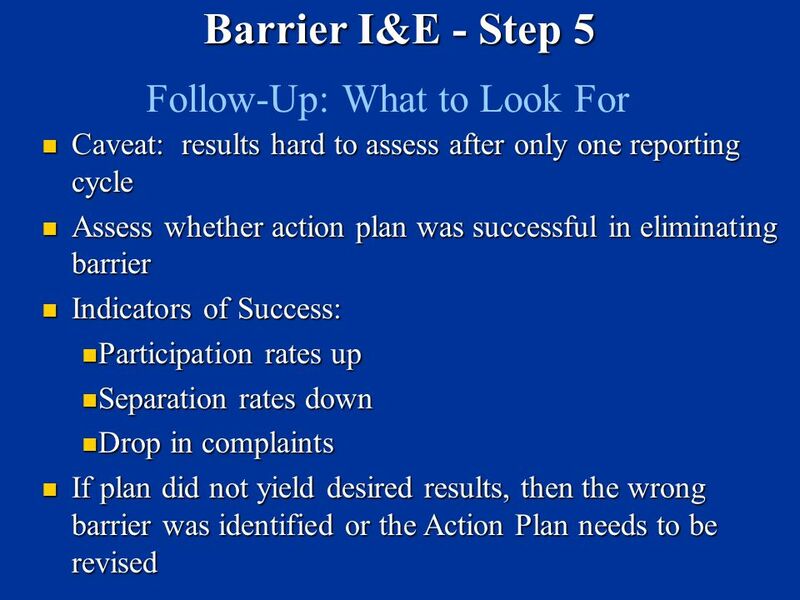 Barrier I&E - Step 5 Follow-Up: What to Look For Caveat: results hard to assess after only one reporting cycle Assess whether action plan was successful in eliminating barrier Indicators of Success: Participation rates up Separation rates down Drop in complaints If plan did not yield desired results, then the wrong barrier was identified or the Action Plan needs to be revised Barrier analysis should be: (1) focused; (2) methodical; and (3) involve the participation of all relevant agency officials. 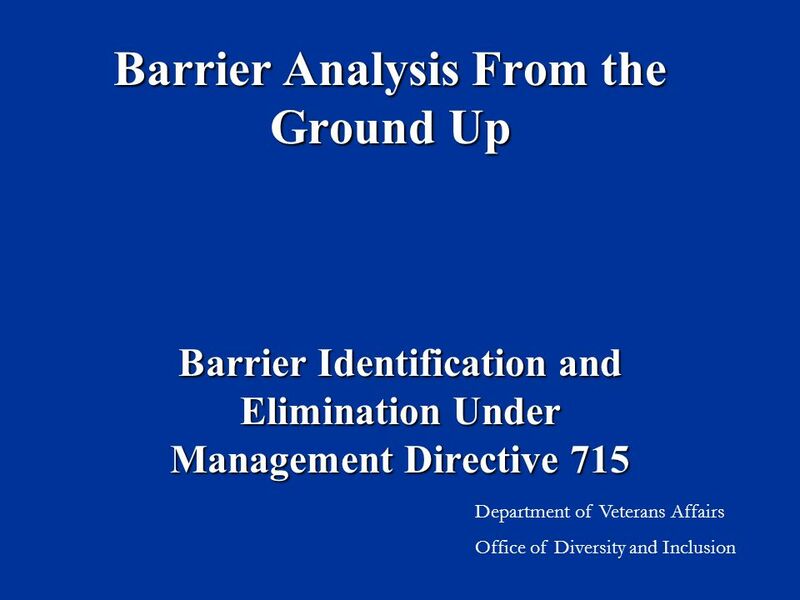 Download ppt "Barrier Analysis From the Ground Up"
Preventing Discrimination & Harassment. Equal Employment Opportunity Cuesta College is an Equal Opportunity employer. All employees who participate on. 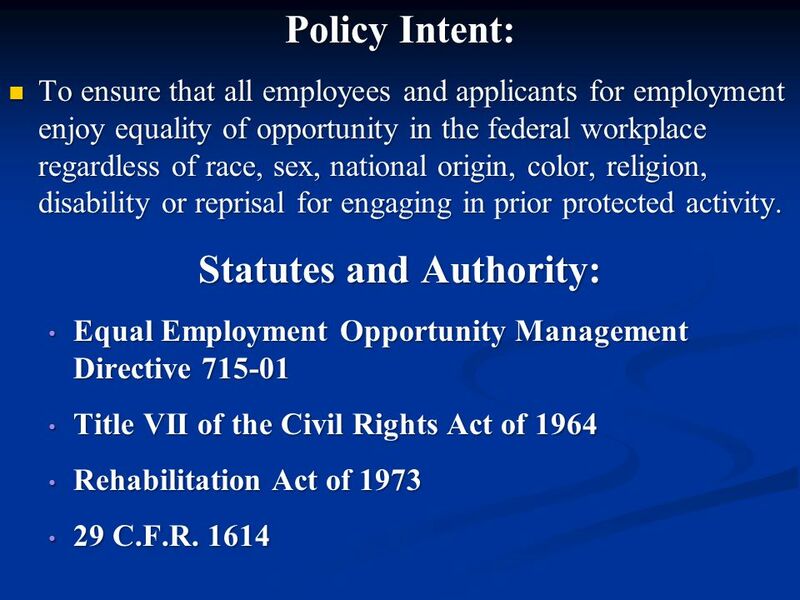 18-11 Employment Discrimination and Affirmative Action. Presentation Name Recruitment and Accrual of Special Populations Special Population Committee Elizabeth A. Patterson M.D., Chair. IOWA H ispanic E mphasis P rogram Iowa NRCS Civil Rights Committee Des Moines, IA Iowa HEP Manager Paul Vondra (319) Monthly. O FFICE OF D IVERSITY AND I NCLUSION 24 January 2011. Civil Rights Training School Nutrition Programs. What are Civil Rights? Civil Rights refer to the: rights of “personal liberty” guaranteed by the 13 th. UPS OPERATIONAL POLICY UPDATE FEBRUARY Affirmative Action Data EEO 1 Ensure that Affirmative Action/Equal Employment Opportunity data is collected. Managing Diversity MAN-3/2 Erlan Bakiev, Ph. D. IAAU Spring 2015. Broadening Participation for Greater Diversity Sarah Pritchard Associate General Counsel August 2012 Content is subject to change, as laws & regulations. 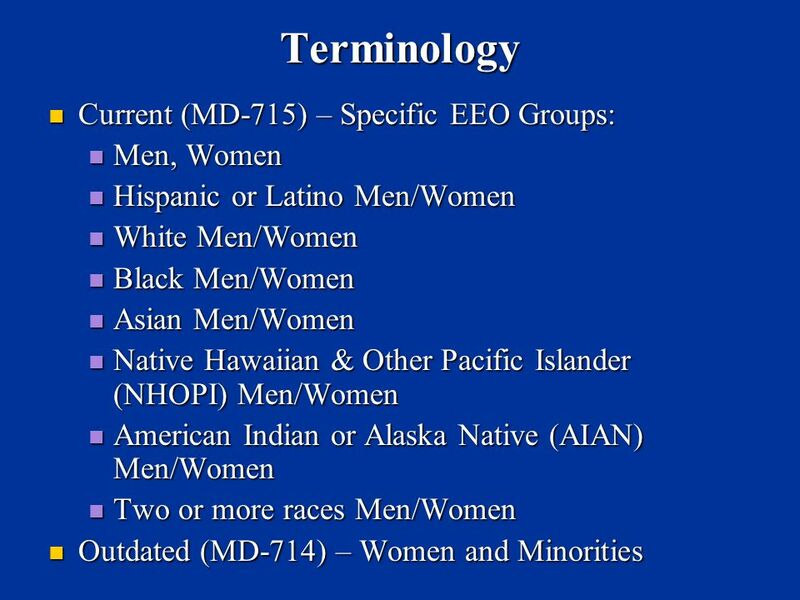 Pan Pacific Law Enforcement Association Challenges Facing Asian/Pacific Islanders in the San Diego Police Department Note: This was a presentation presented. 8/17/20101Office for Institutional Equity and Compliance|| Affirmative Action Plan Office for Institutional Equity and Compliance Park Central. 3-1 Copyright ©2010 Pearson Education, Inc. publishing as Prentice Hall Understanding Equal Opportunity and The Legal Environment Chapter 3. Copyright ©2016 Cengage Learning. All Rights Reserved. May not be scanned, copied or duplicated, or posted to a publicly accessible website, in whole or. 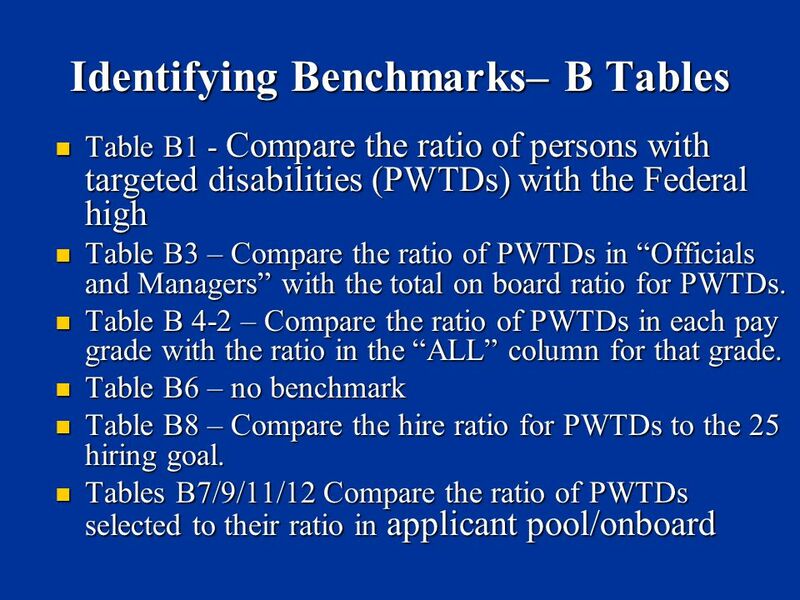 Equal Employment Opportunity (EEO) 11/29/2012 Anita Heard Equal Opportunity Specialist. Human Resources: Objectives 1. Describe work environment of desired career positions 2. Relate environments to hiring policies and procedures. 3. Describe.